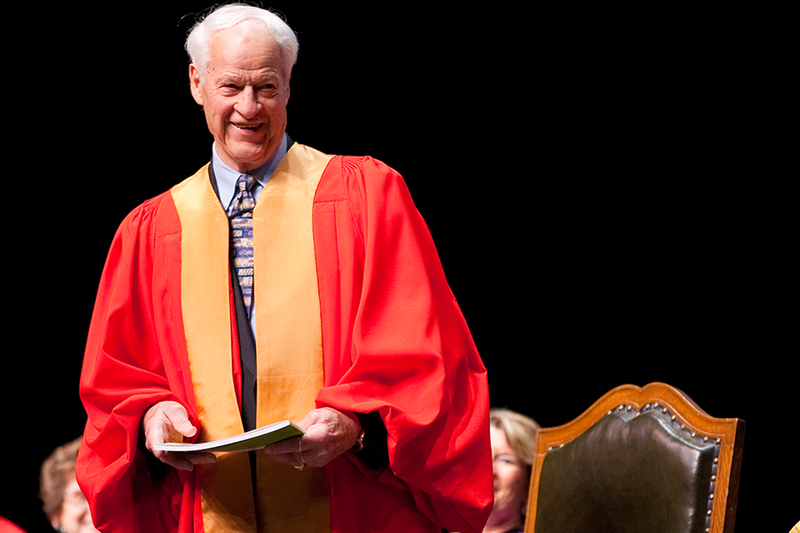 That's Dr. Hockey to you: Gordie Howe receives an honorary Doctor of Laws at U of S Spring Convocation 2010. The U of S is remembering Gordie Howe, a Saskatoon hockey hero who passed away this morning. Howe was born in the small town of Floral, Sask. in 1928, and grew up in Saskatoon. Growing up, the ambidextrous Howe played hockey throughout the province. He was noticed by a Detroit Red Wings scout in 1944 and, just two years later, made his NHL debut with the team. Howe led the league in scoring each year from 1950 to 1954, then again in 1957 and 1963. He ranked among the top ten in league scoring for 21 consecutive years, and set a league record for points in a season (95) in 1953. Howe won the Stanley Cup with the Red Wings four times, won six Hart Trophies as the league’s most valuable player, and won six Art Ross Trophies as the leading scorer. He played with the Red Wings for almost 30 years, retiring in 1971 and was inducted into the Hockey Hall of Fame in 1972. He is considered one of the greatest hockey players of all time. See more about Gordie Howe’s legacy at sportsnet.ca.